Challenge Cup semi-final celebrations for Waringstown against CIYMS. Pic by Pacemaker. 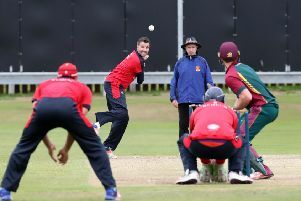 It was back in 2014, during Shaheen Khan’s first spell as Waringstown’s overseas professional, that the South African professional struck a brilliant hundred in an NCU Challenge Cup semi-final at Belmont. However, a thunderous rain storm during the tea interval that day left the CIYMS square under water and washed out the game. Even though Waringstown won the replayed tie, Khan’s first Waringstown century was obliterated from the record books. It was an historic day for the villagers, the 291 they chased down from the very last ball represented their highest run chase in a 50-over game, beating the 287 they amassed in a Kyle McCallan-inspired triumph over North Down in 2010. At 105 for four in the 25th over, with in-form Adam Dennison having gone for 45, the asking rate climbing and facing probably the best bowling attack in the NCU, Waringstown were most definitely second favourites. But Khan, fresh from his remarkable T20 century against CSNI, was a man on a mission. He dominated a 53-run stand for the fifth wicket with Greg Thompson, before a partnership with wicketkeeper Marcus McClean for the sixth wicket that effectively decided the contest. Khan, who was missed badly at mid-off early in his innings, struck 10 fours and five sixes, and in truth the fire had gone out of CI bellies by the time he departed in the 44th over, with he and McClean having added 99 in little more than 11 overs. Khan had made 126 from just 95 balls, but with 33 still needed and a lower order missing McCallan, CI had a window of opportunity, which opened further when Ross Waite was run-out without facing a ball from the very next delivery. McClean continued to defy the home team however, striking one four and two sixes in a superb 42, and when the last over began from Allen Coulter, the visitors needed just three for victory. However, from the first delivery McClean and Gary Kidd attempted to run a bye and McClean didn’t make his ground. After two dot balls to James Mitchell, Coulter bowled a wide and then Mitchell was run out attempting to get Kidd back on strike. With nine wickets now down, Kidd managed a single from the penultimate ball to make the scores level, but CI would still have won if the scores had been tied by virtue of having lost fewer wickets. However, from the final ball of the match, Phil Eaglestone missed but he and Kidd ran another bye to take Waringstown home by one wicket. It was a vindication of sorts for Thompson’s decision, which raised eyebrows, to bowl first on a baking hot day. CI were pulled back by the spinners with Chris Dougherty top scoring with 78 and Matt McGillivray capitalising on a series of dropped catches to make 73.